These fragile honey wafers are based on a recipe that appeared in Stephanie’s Seasons, where they were teamed with a banana cream. They can be stored in an airtight container for up to 3 days. Excess batter will store well, covered, in the refrigerator for several days. Preheat oven to 180°C. In a food processor, cream butter and sugar. Add honey, flour, ginger and egg whites and blend to a spreadable consistency. Spread batter onto baking trays lined with baking paper to form 8 cm rounds (you need 24 wafers in all). Bake for 7–8 minutes until golden brown. Cool wafers for 1 minute and then, using a flexible spatula, lift onto a wire rack to cool. To serve, mix raspberries with cream, crushing berries a little to stain cream pink. Anchor a cold wafer to each plate with a tiny dob of cream. 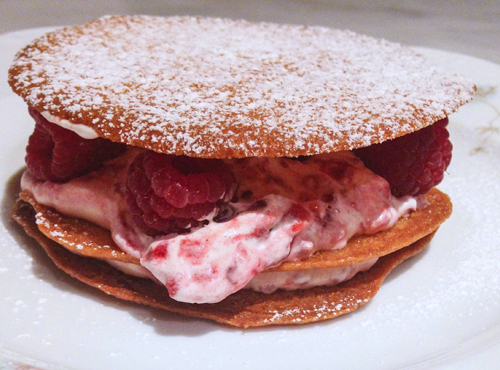 Pile on a spoonful of raspberries and cream, balance another wafer on top, pile on a second spoonful of cream and top with a third wafer biscuit. Dust with icing sugar.